FoE recognise the sovereignty of Indigenous nations throughout Australia. We seek to work collaboratively with Traditional Owners in our environmental campaigning, especially where Indigenous lands and communities are directly impacted. For FoE Australia's Indigenous Land and Rights policy click here. We understand that social issues are inseparable from environmental considerations, and this extends to the social, cultural, political and historical context of Australian Indigenous people. FoE acts as the secretariat for the Australian Nuclear Free Alliance (ANFA). Formed in 1997, the Australian Nuclear Free Alliance (formerly the Alliance Against Uranium) brings together Aboriginal people and NGOs concerned about existing or proposed nuclear developments in Australia, particularly on Aboriginal homelands. The Alliance provides a forum for sharing of knowledge, skills and experience. It is an opportunity to come together and find strength through our shared aims to protect country and culture from nuclear developments. The Alliance is currently running campaigns concerning uranium mining in SA and NT and the proposed radioactive waste dump at Muckaty Station near Tennant Creek in NT. For further details, please visit the ANFA website or the FoE anti-nuclear pages here. Related articles Kulini Kulini Bush Camp. Every year, FoE runs a Radioactive Exposure Tour ('radtour') to South Australia where we visit the Olympic Dam uranium mine at Roxby Downs, the Beverley uranium mine in the Gammon Ranges, the beautiful Lake Eyre and Mound Springs, the Gammon Ranges, the gorges of the Flinders Ranges, and much more! We meet and travel with indigenous peoples and local communities campaigning against the nuclear industry. The tour offers a unique opportunity to go out on to country and witness the impacts of the nuclear industry on people and the environment. You can join the radtour in either Melbourne or Adelaide. For more information please contact jim.green[@]foe.org.au. In Victoria, FoE's Barmah-Millewa Collective is continuing its partnership with the Traditional Owners of the Murray Darling Basin. Together, we ran a successful, decade long campaign culminating in 2010 with over 250,000Ha of River Red Gum forests in Vic and NSW protected. Most of the new parks were handed back to Traditional Owners under either Joint Management arrangements or Indigenous Protected Areas. In Victoria, this was the first time ever that legislation was created to allow Indigenous communities Joint Management rights, and was a real win for land rights justice. Now, the Barmah-Millewa Collective's campaign continues, supporting Indigenous groups demanding restitution of their Water Rights. With the Murray-Darling Basin Plan currently in process, a real opportunity to ensure water rights for Indigenous people is at hand. We are working with Traditional Owner groups throughout SE Australia to ensure "cultural flows" are recognised, enabling Indigenous people to care for their river country, as their ancestors have done for tens of thousands of years. For details check here. 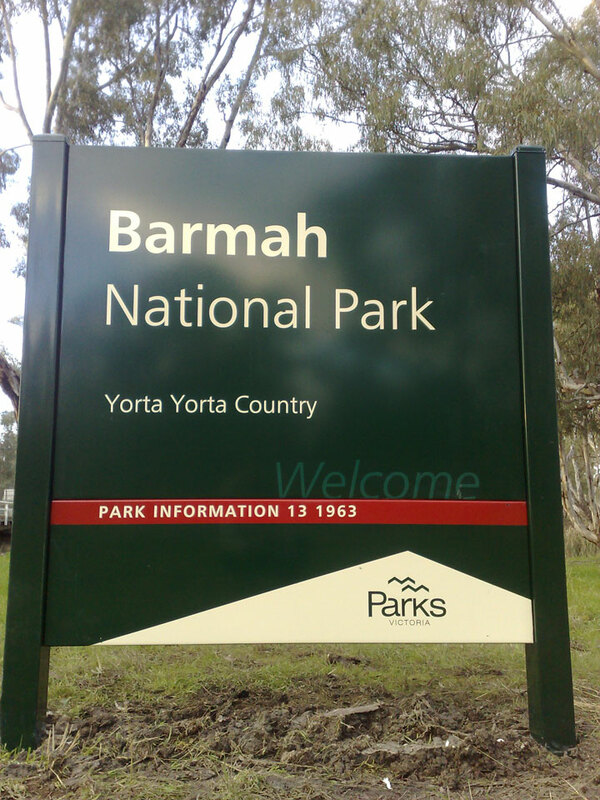 The Barmah-Millewa Collective also partners with Traditional Owners, such as the Wadi Wadi in caring for Nyah-Vinifera Park, on the Murray River near Swan Hill. We are currently working with them on cultural biodiversity surveys - surveying and monitoring both culturall and environmentally significant birds, animals and sites; conducting mutual skills training - in Western ecological data collection, and traditional ecological knowledge; and assisting them with their new Joint Management processes. For details check here. The campaign address both social justice and environmental sustainability and focuses on the environmental and social impacts of mining, forestry, hydroelectric and agrobusiness companies on Indigenous communities both in Australia and Latin America. This campaign demands that mining, forestry ,hydroelectric and agrobusiness multinational companies leave indigenous land and that Indigenous people’s rights to self-determination and autonomy in their territories is respected and protected. West Mallee Protection emerged from an alliance between environmentalists and the Kokatha Mula people of Ceduna in South Australia. For many years, the alliance has promoted positive action to protect the outback Ceduna region, including true conservation of the Yellabinna Regional Reserve and the Pureba Conservation Park on the Far West coast of South Australia. FoE has worked in partnership with numerous solidarity groups for over 10 years to hold Indigenous Solidarity Gatherings. These gatherings are an opportunity for Indigenous and non-Indigenous people from around the world to share knowledge, culture and experiences, discuss success stories and campaign challenges and build greater understanding. For further information on upcoming gatherings please contact Marisol marisol.salinas@foe.org.au. Related articles welcome by Aunty Betty King, Indigenous solidarity group 1997-1999.